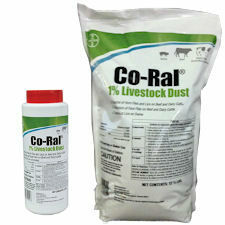 Co-Ral 1% Livestock Dust Insecticide is for direct animal use on beef and dairy cattle against a variety of flies and lice. It can be applied to both beef and dairy cattle. Effective control of the horn fly species as part of a fly control program. Aids in reducing face fly population. Options: 2 lb. 4 x 12.5 lb. May be used to fill cattle dust bags or applied directly to cattle, swine or swine bedding by use of shaker can. When used as recommended, controls horn flies and lice on beef and dairy cattle, and lice on swine. Will also reduce face fly populations on cattle; however, as face flies are able to travel over an area of several miles, best reduction of face fly populations is achieved when Co-Ral 1% Livestock Dust is used on an area-wide basis.